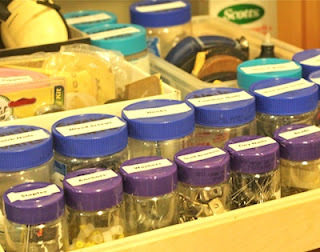 I was born a saver and have tried hard to correct my hoarding ways but there are several types of containers that are just too useful and I still save all I get. 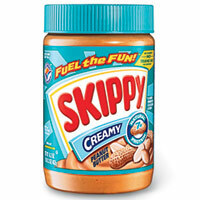 I especially like clear plastic containers with wide screw on tops - like Skippy Peanut Butter and Pounce Kitty treats. Both have been repurposed as hardware storage containers. Once empty I run them through the dishwasher, peeled the labels off, and fill them with sorted hardware. 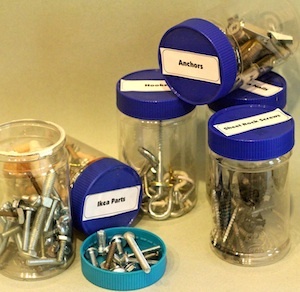 It makes those quick fix chores so much easier to be able to quickly find a screw, or anchor, or nail. I use standard Avery mailing labels and my computer and laser printer to create labels for the covers. Boulder is my favorite labeling font- clear and contemporary. Now my tool drawer is much more functional! I keep savings these containers because it would work for craft supplies, desk supplies, even for cotton balls and Q-Tips! True confession: I did this organizational job two years ago when my old coat closet was redesigned to be a tool closet. I didn't label a thing until it was time to take pictures for this blog post. I always knew the containers would be labeled. Just one of the things on my To-Do list. A side benefit of blogging is that it is forcing me to finish projects. I am traditionally a 95%er. I get 95% of a project done and never quite finish. Today, I finished this one. Feels good. Other containers: I used to saved coffee cans and baby food jars. Changes in packaging have made them less useful. Are there any particular products you use and always save the container?